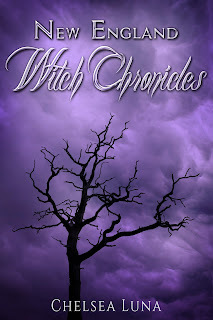 NEW ENGLAND WITCH CHRONICLES is the first book in the four-book bestselling young adult series. The Salem Witch Trials of 1692 were an embarrassing stain on America’s revered past. Innocent people were persecuted at the hands of a few overzealous Puritans, but what if real witches existed during those colonial hunts? What if there are witches in present day New England? That’s what Alexandria Ramsey’s crazy grandmother believes. Grandma Claudia claims Alex descends from a long line of New England witches. Modern day witches in Hazel Cove, Massachusetts? Unlikely, but strange things are occurring in the weeks preceding Alex’s seventeenth birthday. Alex is haunted by bizarre recurring nightmares of a man chasing her through the Hazel Cove Cemetery. On a few occasions, when her emotions have spiraled out of control, inanimate objects have shattered around her. But that’s just a coincidence, right? Alex isn’t so sure, especially after a local girl, who supposedly dabbled in witchcraft, was killed in the nearby forest. Alex knows something strange is happening. With the arrival of a new boy in town, James Van Curen, who is causing problems between Alex and her best friend, Peter, Alex feels like her entire world is on the verge of chaos. Could Alex really be a witch? Is it possible Hazel Cove will become a battleground for modern-day witches and witch hunters? I am so happy that my favourite horror book would be available on Amazon for free.I will definitely seize this opportunity which comes so rare. Amazing Information Admin Please Check My Article On framaroot pingpong root Root Master Thanks a lot for sharing this useful information.